The mid-engine sports car consistently seen parading around in spy shots is not a Cadillac. 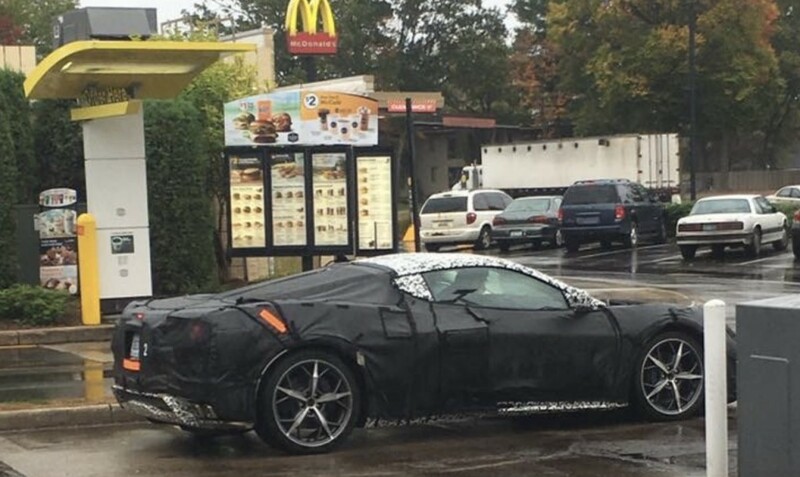 It’s a Corvette, and Chevrolet allegedly took the bold step of teasing the C8 Corvette to its dealership body. According to a “dealer source,” Chevrolet showed teaser images of the car to its dealer body at the National Automobile Dealers Association. The source, Nate Chandler of Van Bortel Chevrolet in New York state, posted to Facebook and the Corvette Forum describing what he saw at the meeting. Photo: Josh Busenbark via “Woodward” Facebook group. He said GM called it a “supercar” and from the two photos shown, the front hood reminded him of a Lotus, while the front fascia was reminiscent of the 2019 C7 Corvette ZR1. Photos and audio were not permitted at the meeting, so we’re simply going on what Chandler is able to recall. So far, no other dealers have come forward to corroborate his claims, however. Aside from the quick teaser images, neither GM or Chevrolet reportedly offered up any other information. Chandler speculated a public teaser could be coming in the very near future, based on how GM spoke of the project. We’ve heard rumors suggesting the C8 Corvette will debut in 2019 and arrive as a 2020 model. With all of the speculation, it still remains unclear if the front-engine C7 Corvette will live on alongside the mid-engine car, though we know the Bowling Green, Kentucky, plant was retooled for greater flexibility. No it is a Cadillac and they are still working on it Roswell with Aliens. It is a big cover up! Sorry had to get that out of the way before someone said it for real. That sounds like it confirms the photos of the nose and tail we saw painted at the plant. It has a resemblance to the present ZR1. Might repost those or link he thread to them you had. He also seemed to confirm from what he could tell the leaked front bumper looks to match the teaser. Of course the C7 will continue alongside the new C8. There would be no new ZR1 if it wasn’t and they don’t want to loose their Corvette base enthusiast. Not everyone can afford a ZR1 let alone a C8 supercar and/or perhaps not want that level of performance yet still wants the Corvette experience with a base/mid level C7. Oh, and don’t count out a Caddy supercar, eventually. C7 will last for about year or two and that’s it. How would a ME Cadillac come into play, as people think it will be, and it won’t, went these Escala is already green-light for 2020-2021? Cadillac is not going to have two halo/supercar’s in it’s line-up. As much as I don’t like the Vette they should have a sub-brand of C—-vette (sorry can bring myself to call it by its full name). Vette crossover- a Vette SUV, pure performance. If the 7 continues it will be only for the Roadster till the mid engine roadster arrives. Note no convertible mules yet. Yes Cadillac May get one but not till 2025 at the earliest or so says JDN. As for a Corvette SUV Hell no! The Corvette is America’s sorts car not America’s SUV not America’s sedan and not America’s CUV. You whore out the name you damage the brand. Porsche has to do it as they offer nothing else GM has the Chevy line that could do any of that with no issue. Corvette is a specific car not a thing. I’ll make it more clear, the SUV and 4-door are Sting-Ray based (Y-body) not a Tahoe in Vette clothes,standard LT1 power, no v6s. Offer awd on all 4 models also. Basically an American Porsche. Thou a Vette tuned Tahoe SS wouldn’t be a bad ideal also. Corvette c8 ME:: LT1 V8, later DOHC N/A V8 engine, 4.6-lter TT V8 engine (TT on side of block), 5.4-liter TT V8 engine (TT on side of block). Hot V configuration for Cadillac models. I can see that DOHC V8 being 5.2-liters. Anything is possible especially given the facts of just the past few days where Lockheed Martin’s Skunkworks has been given a US Patent for a nuclear fusion reactor and Cadillac introduced their LTA twin-turbocharged 4.2L DOHC-4v V8 which is designed for even higher performance than it’s current 550 horsepower as with 4 fuel pumps, one could see 650-750 hp which would make the LTA ideal for a sports car.